The current show at MOBA’s main gallery is a tribute to the wonderful animals that inspire artists all over the world. Struggling amateurs and accomplished artists portray their pets as well as animals in the wild and even animals that exist only in their imagination. This exhibit includes pets, particularly dogs, as well as jungle creatures, birds, and one dead fish. As always in a Museum Of Bad Art showing, each piece is accompanied by an insightful commentary. About 20,000 years ago, humans were painting animals in the caves of Lascaux, France. These images were large horses, stags, cattle, and few felines, bird, and other creatures. This tells us that the impulse to portray animals is deep in our humanity. 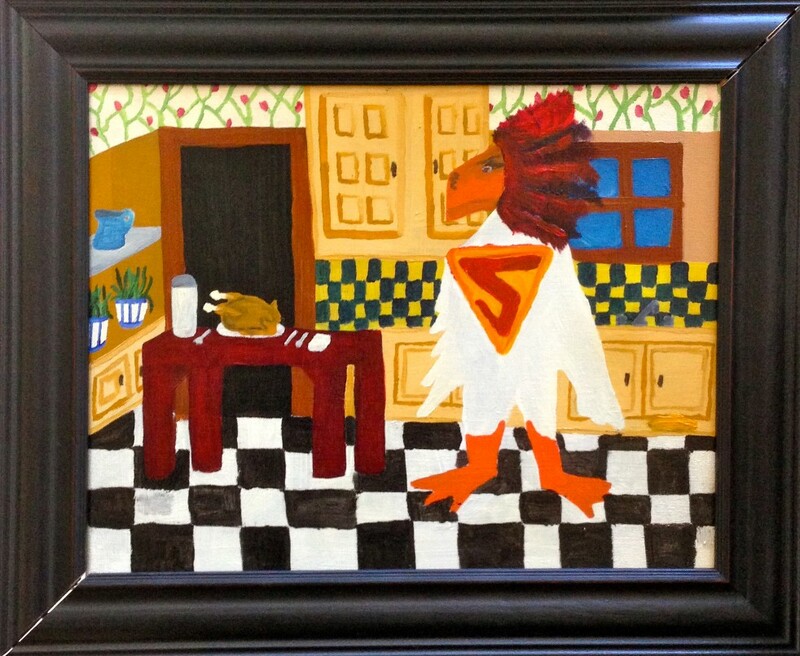 Returning home from a hard day at work, Super-Chicken finds dinner on the table. He is not amused.